The First ever AMD Ryzen 7 1700 and Intel Core i7 7700K processor comparison have recently been posted on YouTube by a popular YouTuber named as DinoPC. This comparison video is the very first on any of the two Processors ever. 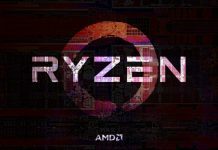 We saw a number of leaks that revealed the performance of Ryzen 7 series processors. 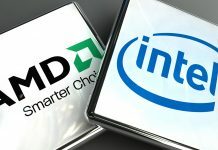 According to a multitude of the leaks and AMD Official statements and presentations the performance of Ryzen 7 Series processors should cross Intel’s Broadwell-E series processors. If not then it should be equal, as suggested by the enthusiasts. 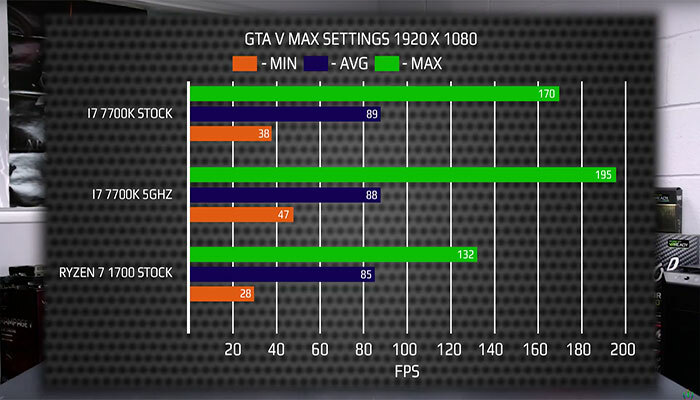 DinoPC’s tested for both of the processors performance on GTA V via Cinebench R11.5. The platform that DinoPC used for testing purposes had the following spec. DinoPC tested both of these setups on One game only, but the results are largely familiar with multiple other titles that were tested off the screen. 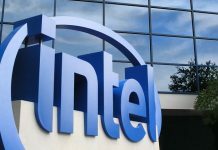 The test showed that Intel’s Core i7 7700K processor completely outran AMD’s Ryzen 7 1700. The test was conducted in both Stock and Overclocked settings, but despite the Core difference, it never changed. Intel’s Core i7 7700K outran Ryzen 7 1700 because of a number of reasons. These reasons include the difference in operating base frequency, clock speed, and compatibility with the motherboards. Intel’s Core i7 7700K processor runs on a Base Frequency of 4.2 GHz (boosts to 4.5 GHZ) as compared to AMD’s Ryzen 7 1700 that operates at a base frequency of 3.0GHz (boosts to 3.5GHz). So this difference definitely has an influence on the performance regarding what type of processor is being used. As we know that GTA V requires fast processing speeds and needs faster clock speeds, the difference is a must because of the different operating frequencies. AMD’s Ryzen 7 1700 goes only to 30FPS highs and that is what can cause problems while playing high-end games. One possible solution to this kind of problems is the OverClocking. It can take Ryzen 7 1700 to a bit higher FPS that’s comparable to Intel’s Kaby Lake series processors. 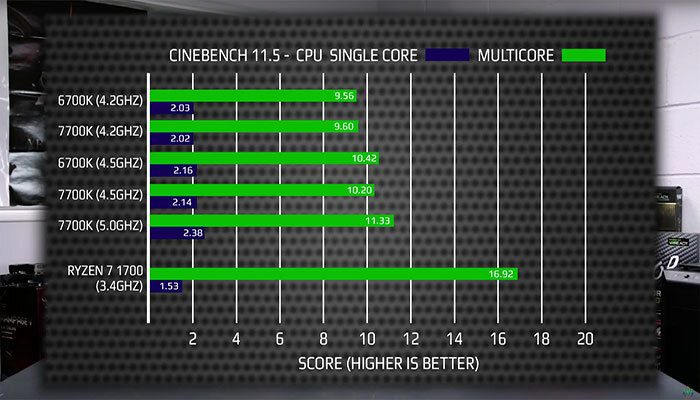 Following is another Image for both of the Chips in Cinebench R11.5. Here Ryzen 7 1700 is clocked at 3.4GHz (higher than stock 3.0GHz). This processor is compared with various Intel Chips (with base frequencies of 4GHz). 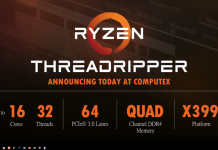 This cleared out all the confusions and we can see that Intel is a lot more reliable in Single-thread performance, but it loses the grip in Multi-thread performance tests. This test clearly shows that Ryzen can be trusted by developers who use Multi-core Optimized Application Program Interfaces and multiple Software Layers. To know about the real potential of Ryzen processors, we’ll have to use good optimizations for any Multi-core tech. This will enable us to know about how vast are the utilization abilities of Ryzen 7 1700 processors. Following are the specs of some Ryzen processors according to their processor types and comparison with Intel’s Core i7 class. AMD Ryzen 7 1700 processor is an Entry level 8 Core, 16 thread processor that will cost you about $329 upon release. 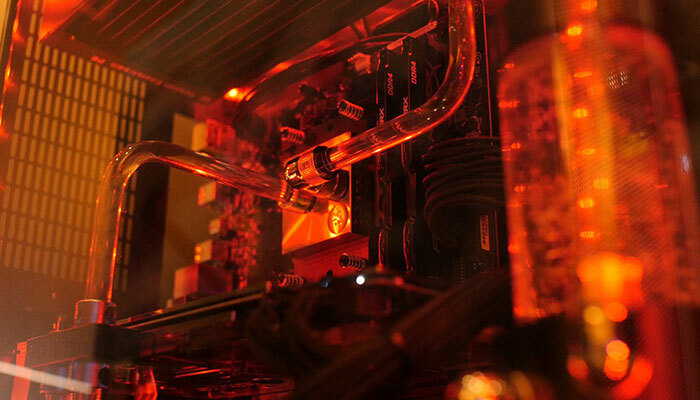 The model also goes by the name AMD 7 1700X. It operates at a base clock frequency of 3.0GHz with boost capabilities of 3.7GHz max. With performance better than the Intel Core i7 7700 and almost 30 to 40 dollars less in price, AMD Ryzen 7 1700 is definitely a better choice. The L2 and L3 caches of the Processor are about 20MB (4 + 16) and it offers TDP of 65W. All the Processors in Ryzen 7 series contain 8 Cores and 16 threads. The series further lets you boost up the base frequency from 3.0 GHz to 4.0GHz. 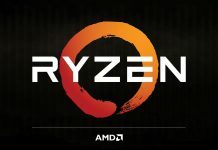 The Ryzen family includes processors such as 7 1800X, Ryzen 7 Pro 1800, Ryzen 7 Pro 1700, and Ryzen 7 1700X. Previous articleNokia 3310 Priced at $62 | Exclusive To Carphone Warehouse In The UK | To Be Named Nokia 3310 Reboot?